Founded in 1991, DJ Element Productions has been providing professional Disc Jockey and Event Planning services in the Southern California market for nearly 20 years. With many weddings and events in the books, we have the experience needed to effectively plan the entertainment on your big day. Our approach as an organization is simple…to offer our clients great music, great presentation, and outstanding customer service. As owner of DJ Element Productions, Lem Lachica has a deep knowledge of all things related to the DJ industry. He is an established nightlife DJ and wedding DJ. Lem has the experience, knowledge, and creativity to effortlessly walk clients through their event planning process. 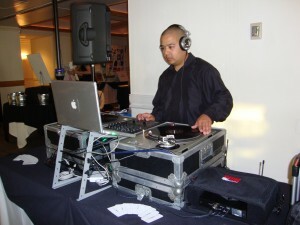 He was inspired by mobile DJ crews such as Unique Technique Productions and Legend Entertainment. DJ Element Productions is a member of the Association of Professional Entertainers (APE) and carry a $1,000,000 General Liability Insurance Policy.